Fundamentals of Audiology for the Speech-Language Pathologist, Second Edition is specifically written for the speech-language pathologist working with hearing impaired populations. This accessible text incorporates the expertise of audiologists along with the knowledge and experience of speech-language pathologists. 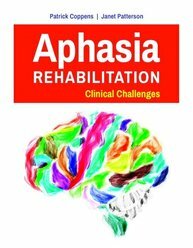 Historically, textbooks on aphasia have offered little or no in-depth coverage of rehabilitation. Little attention has been given to the complex rehabilitation challenges faced by professionals. Now, these professionals will have an up-to-date resource on modern clinical aphasiology with Aphasia Rehabilitation: Clinical Challenges by Dr. Patrick Coppens and Dr. Janet Patterson. Communication Sciences and Disorders: From Science to Clinical Practice, Third Edition is an introductory text for students enrolled in their first communication sciences and disorders course. This text contains basic information about speech disorders that are related to impairments in articulation, voice, and fluency; language disorders in children and adults; and hearing disorders that cause conductive and sensorineural hearing losses.